I like anchovies. I like them quite a bit, and I’m a bit bewildered that they’ve got the reputation they do. The chewy fish run right up to the edge of “Mercy, this is too salty” and, in my opinion, stop just short. I think they’re delicious, but they’re not the easiest thing to incorporate into a meal. They’ve got quite an attitude, and they’re prone to standing at the forefront of a dish regardless of where you put them. So while I’m quick to try and incorporate them into a sandwich, the boldness they bring is of particular concern. A good sandwich, as we all know, relies on balance. What could stand against the anchovies? My thoughts quickly turned to eggs. A perfectly fried egg, the yolk warm and runny, is incredibly rich. That seemed like just the thing to balance out the anchovies. I started with a large roll, spreading roasted garlic across the top and laying a bed of caramelized onions and tomatoes on the bottom. Now, I must admit that I can be a man of appetite and I’m unlikely to open a tin of anchovies then put some aside for later. This was where I first cast restraint aside, reasoning that I had a full tin of anchovies, so they all ought to all go on the sandwich. With that many anchovies, then, I figured that I needed two eggs to achieve the balance I was looking for. That decision, dear readers, would prove to be my undoing. I like a soft yolk in my fried egg, and so I accept that any fried egg sandwich I make is probably going to be a bit messy. The egg/bacon/avocado breakfast sandwich I wrote about earlier was a bit messy, but the two sandwiches I prepared that day were both tremendous. And that’s the rub, friends. That day two sandwiches, this day one. And the gulf between two fried egg sandwiches and a sandwich with two fried eggs was one I wasn’t capable of crossing. This sandwich was just a complete mess. The roll just couldn’t handle all of that yolk. I was left with hands covered, but afraid that if I put the sandwich down I might never get it back together again. I would like to note that construction aside, this was a good sandwich. The flavors were on point, the richness of the eggs married with the anchovies exactly as well as I suspected it would. But I lost my head in making it, and absent proper restraint I can’t rightfully call this a good sandwich. I tried something and I failed. 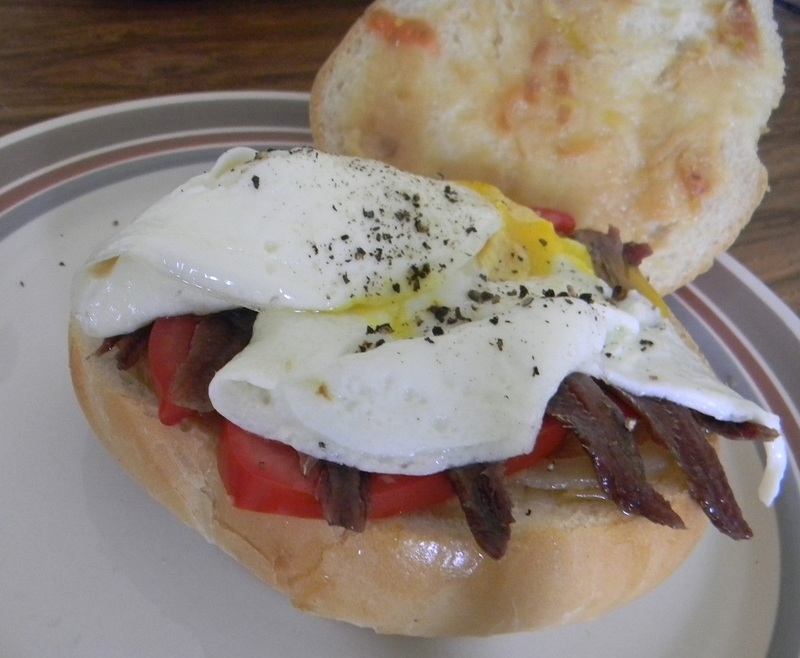 I learned a few things and I feel my next anchovy sandwich will be absolutely excellent, but there was no excellence here, just a lot of anchovies and a whole mess of egg yolk. This entry was posted in Sandwich Reviews and tagged Egg, Fish, Reviews by Pete, Sandwiches I Have Made by Pete. Bookmark the permalink.